Grace Kids builds kids lives by helping them become more and more like Christ. By partnering with families during the early years of growth, Grace Kids helps create a foundation for spiritual, emotional, and intellectual development. We create clean-safe environments that meet the developmental needs of each child. Also, we provide resources for families to support this development. Check out the Parent Que (to the right) that helps you chat about the bible lesson with your kids. 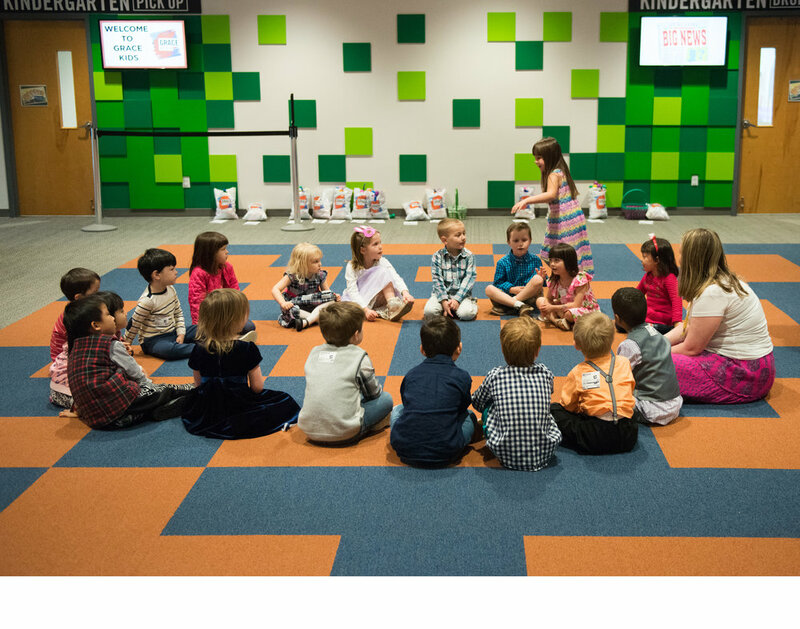 Grace Kids Elementary is a fun-filled, enthusiastic service geared to the specific needs of elementary schools students. We capture the child’s attention while training them for a lifetime of following Jesus and becoming a part of a spiritual family. It’s amazing! 1) Fill out this First Time Guest Buddy Request Form (submitting the form 48 hours notice before attending service is helpful in order to coordinate a buddy). After filling out the form you will be e-mailed by your prospective buddy. 2) Attend the 9:30 service and meet the buddy in the Grace Kids wing. If you are interested in serving with Grace Kids please click the button below. If you have questions, please contact Ethan Brooks, the Grace Kids Director. His email is: ethan@gracelife.com. Grace Students exists to create environments where high school and middle school students can discover how to follow Jesus step by step. Grace Students is the weekly gathering on Wednesdays of the Grace Church Student Ministry. We have three separate environments. 56 is for 5th and 6th graders and meets in Grace Early Childhood area. 78 is for 7th and 8th graders and meets in the Grace Kids Auditorium, and High School which meets in the main worship center. We’re dedicated to providing a place for students (5th -12th grade) to connect with God, with other students, and with committed leaders that are dedicated to seeing students grow closer to Jesus. Doors open at 5:30pm with $1 dinners. The services are 6:30pm - 8:30pm. Grace Students Middle School is the weekly teaching environment for 6th–8th grade students at the 9:30am and 11:15am services on Sunday morning. Each week, students experience a combination of teaching and interaction with peers. Students explore their relationship with Jesus and how that can influence every decision they make. Grace Clubs takes the Grace Students experience away from Grace Church and brings it to your school. Every Christ follower gets to share their faith in lots of places in all kinds of ways. Grace Clubs create opportunities for the creation of these conversations. Grace@UNC exists to connect UNC students to Grace! Being away from home can be hard, but strong relationships within and to a local church can make such a difference. Grace Church wants to be a home away from home! We do this by providing rides to services and other church events, hosting on-campus small groups led by Grace Church members, facilitating relationships within the student body for mutual support, and connecting students to ministries to serve or receive ministry. However long college students attend Grace, our goal is to see them grow, serve, and be sent out better equipped to do all God has called them to do! Grace has a free shuttle service from UNC to Grace every Sunday to both of our services. We have meetings on campus, both large and small! We also connect students through informal events and social gatherings. Check out the small group page, and email us at campus@gracelife.com with questions or to be added to our GroupMe or email list.